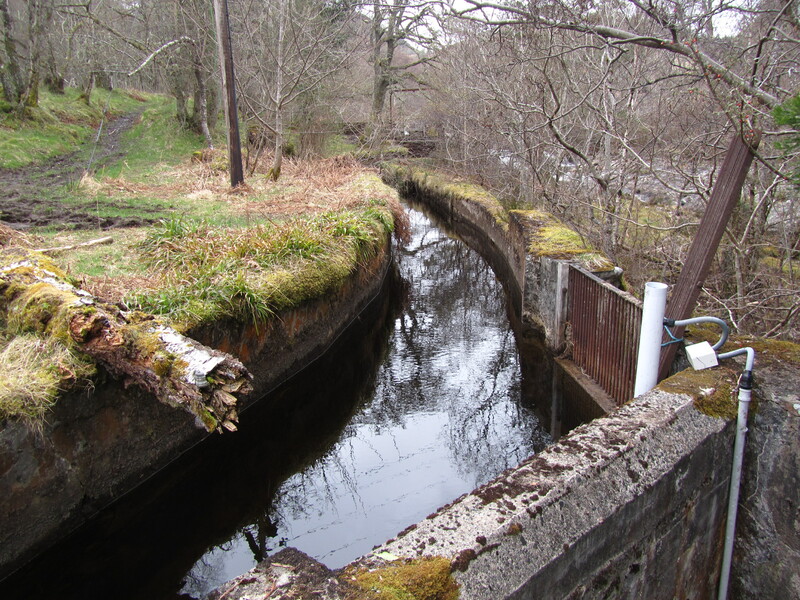 The scheme seems to have gone through several phases before being abandoned probably in 1961 when the flow of water down the river was reduced due to the construction of the Orrin Dam, part of the wider Conon Valley Hydro scheme, in the higher reaches of the river. 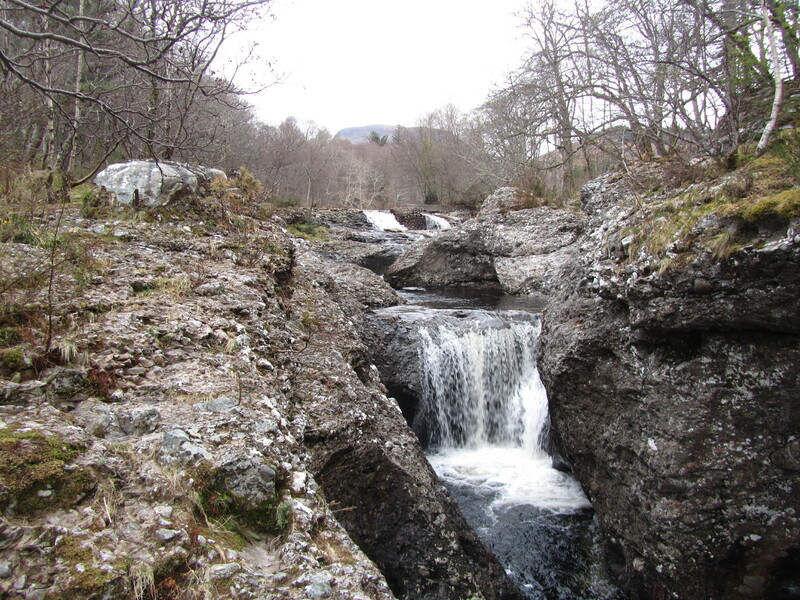 Nevertheless the Orrin Falls hydro-scheme was revived in the early 1980s and now provides electricity for Fairburn House. My first task was to survey it and make a sketch. The survey was done by using a combination of compass and pacing with GPS Way Points to confirm (or otherwise) significant points. Once home I “drew-up” the sketch on polyester film using the survey as a template. I have often drawn up sites using a CAD programme (equivalent “Inkscape”) but in many respects I like the end result of a hand drawn plan better, so I decided to go with this. Two years ago Ian Parker of the Survey and Graphics Dept, RCAHMS (now retired), had talked me through his method of hand drawing sites giving me hints and tips along the way, I now feel much more confident. 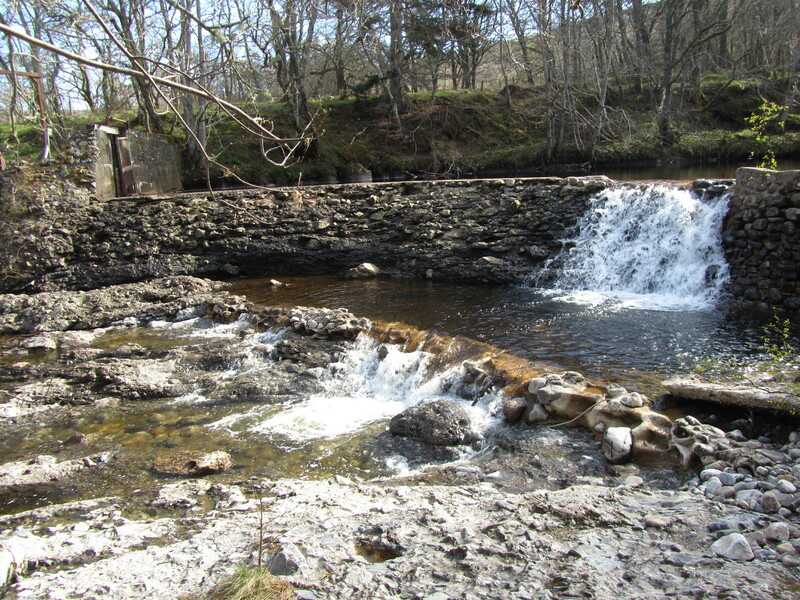 The remains of an earlier dam are seen to the east/downstream side of the present dam. Although ruined, it appears to be of similar construction to the present one; it is probably the one in the c1900 photo. The lade is a concrete “box” channel roughly 50m in length; it is c.2m deep and 1.5m in width. 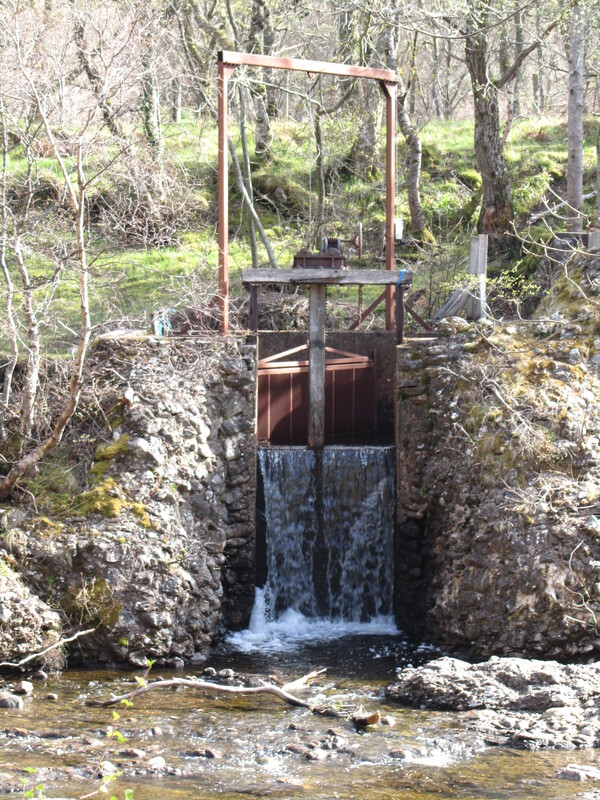 There are three wooden sluices; two at the west end and one at the east end, two metal grids for catching floating debris (the one positioned diagonally is controlled by an overhead hoist) and two overspills, the one at the west end appears to be redundant. The east end of the lade comprises a split channel of two short parallel sections; the S section has a sluice part of which is covered by wooden planking, the N channel appears to be redundant and is blocked off by a concrete wall. The lade viewed from the east. 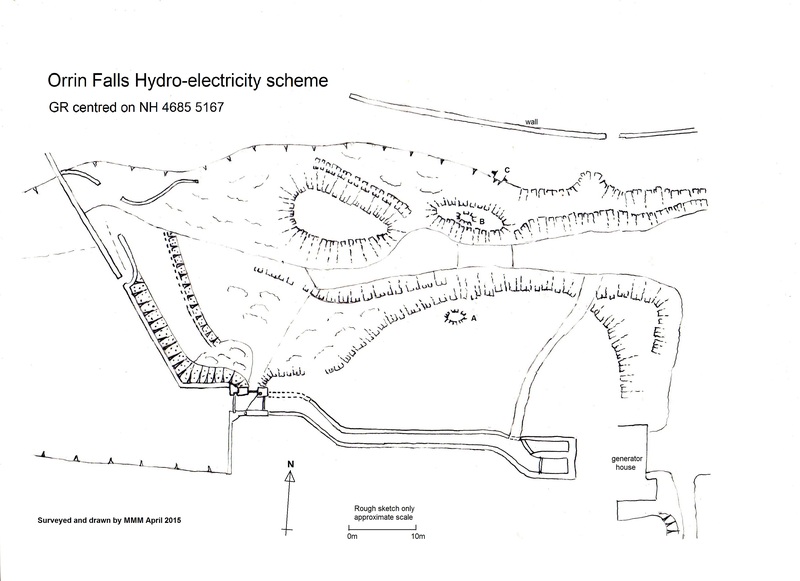 A rock cut channel on the north bank may be an early fish ladder possibly predating the hydro-scheme; it is at a higher level than is necessary today and roughly 20m in length, 1m in width and 1m deep. The abutments of a bridge are situated in the middle part of the gorge above a waterfall. 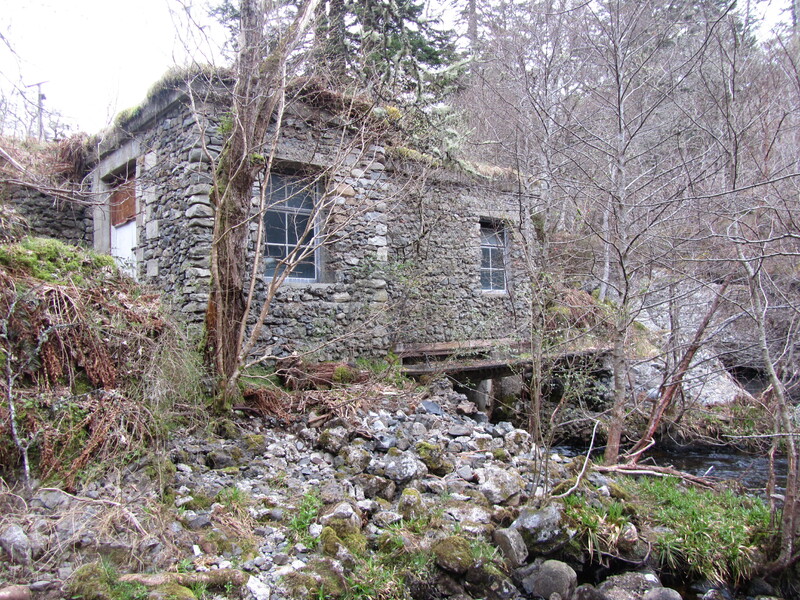 The bridge was probably built at the same time as the hydro-scheme to provide access to it. 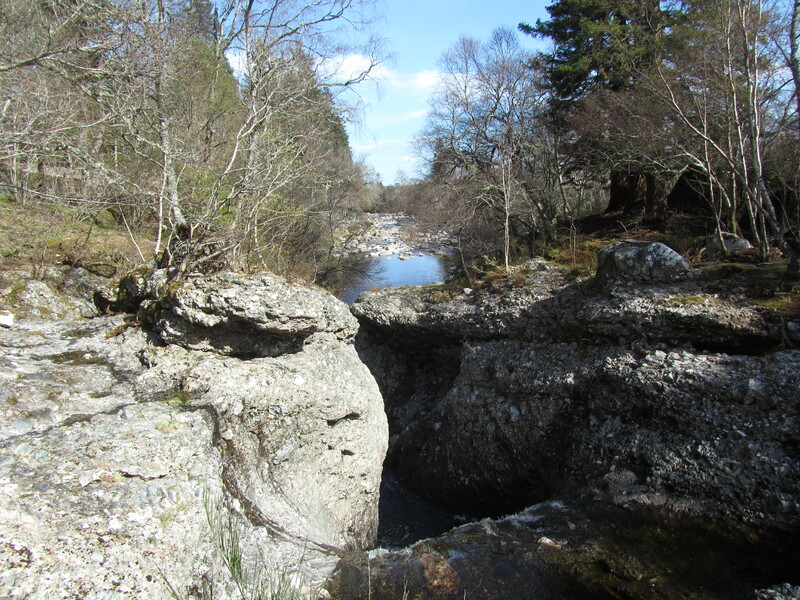 It is in two sections, at a slight angle to one another; the south abutment, (A on the sketch) is constructed of 2 large boulders with infill of concrete and small boulders. The north abutment (C) is a small platform 2m2 with stone faced sides built into the north bank of the river and the middle abutment (B) is a small concrete and stone structure with evidence of old cables and pieces of the wooden deck on top of a rocky knoll on the edge of the gorge. 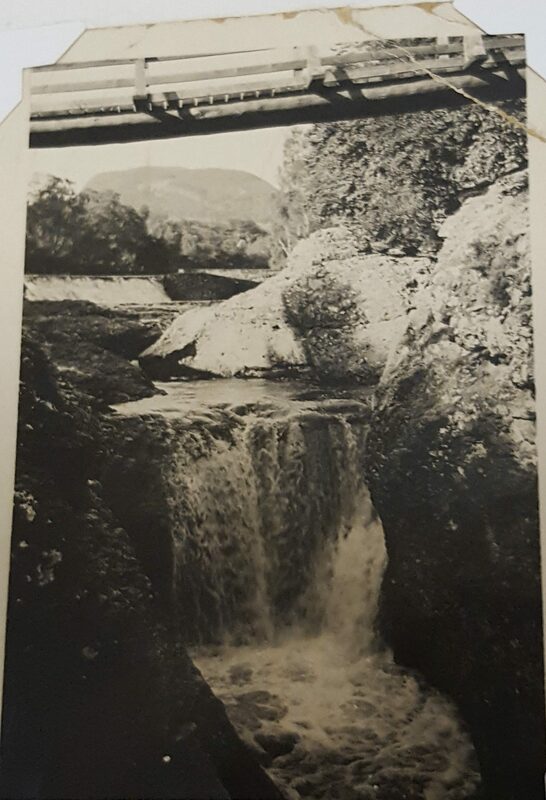 The central part of the gorge with the abutments A and B seen on either side of the waterfall, the dam can be seen in the distance. After this other matters took over and Orrin Falls was forgotten about!! It wasn’t until 4 weeks ago, with deadlines for submission to the Discovery and Excavation annual publication coming up, that I thought I had better write the report up and submit it to both the databases. Writing up was easy because I had done all the hard work; it was just a matter of putting the data together. 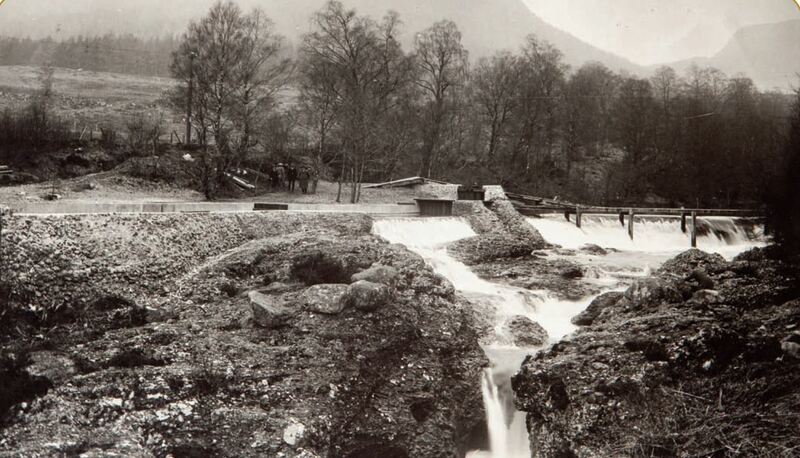 But I also needed to contact the landowner for permission to use the old photo c1900. 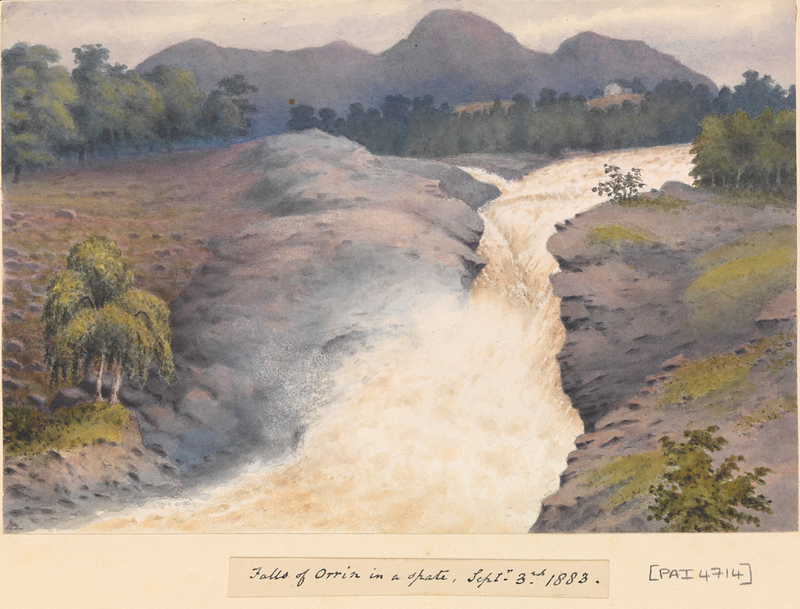 She was most interested and kindly provided me with supplementary information and additional photographs, one of the bridge and one of a Victorian painting (not reproduced here) of the Orrin Falls. The final stage was submission of the report to the databases. Highland Council HER was easy it was just a case of sending the information by email to Ian Scrivener-Lindley or HER@Highland.gov.uk And incidentally our own Tim Blackie has recently volunteered to help with uploading information submitted by NOSAS members to the database so we have a direct link. As far as Canmore is concerned submitting information was done by filling in the on-line forms for Discovery and Excavation Scotland (the Archaeology Scotland annual publication). Not only will the site appear in the publication but it will also be transferred onto the Canmore website automatically.